CRISPR/Cas9 genome editing has become widely used due to its simplicity and versatility, and the CRISPR technology has been adapted for diverse applications aside from genome editing. As a leader in gene synthesis and genome editing, and through our partnership with Feng Zhang's laboratory at the Broad Institute of MIT and Harvard*, GenScript offers validated CRISPR products, services and resources to help you harness the power of CRISPR genome editing for your research. CRISPR-associated protein (Cas) is an endonuclease that cuts foreign DNA, allowing integration into the host genome. Cleavage only occurs when there is a protospacer adjacent motif (PAM) around the targeted sequence of the invading DNA, ensuring highly accurate targeting. Researchers studying CRISPR have adapted it for use as a tool for genetic modification of the target host genome. CRISPR/Cas9 has recently become a popular genome editing tool, due to its simplicity and versatility. If you are new to CRISPR, GenScript has a variety of free resources to how you learn more about the technology, common issues or bottlenecks, and other recommendations for implementing CRISPR into your research. Watch previously-aired webinars on-demand, with helpful tips on designing and using gRNA and Cas9 constructs, CRISPR libraries, designing KO mammalian cell lines, and more! 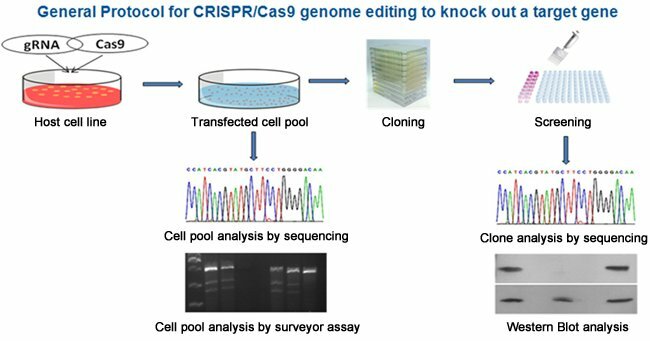 Have questions about CRISPR/Cas9? Learn more about the advantages of CRISPR and how to integrate it into your research. Of the other gene editing technologies available, CRISPR/Cas9 has stood out for its simplicity and efficacy. 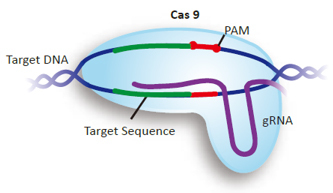 The CRISPR system requires only a few simple DNA constructs to encode the gRNA and Cas9, and if knock-in is being performed, the donor template for HR. As a result, CRISPR gene editing is an approachable technique for use in any lab regardless of molecular biology expertise. 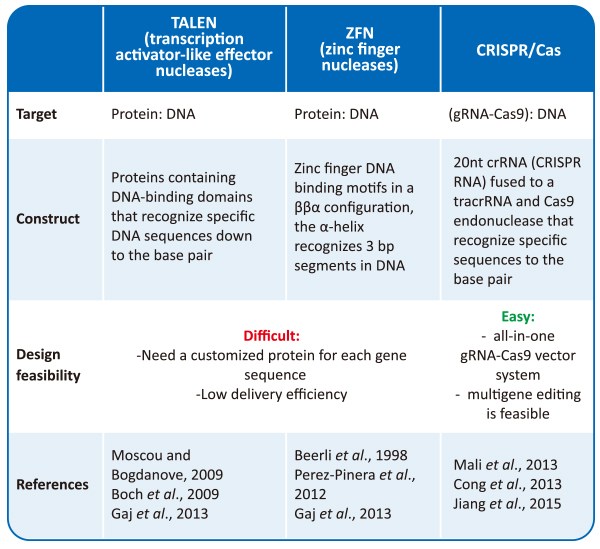 The table below outlines a few of the key differences between CRISPR gene editing and other popular techniques. Once Cas9 nucleases are guided to the target DNA and create a double strand break 3-4 bases upstream from the PAM sequences, there are two ways the double strand break (DSB) can be repaired. 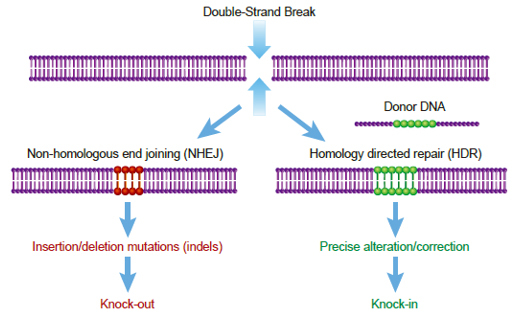 If there is no donor DNA present, resolution will occur by error-prone non-homologous end joining (NHEJ), resulting in an indel that effectively knocks out protein function. Alternatively, if donor DNA sequences are available, the DSB is repaired by homology directed repair (HDR) for precise knock-in of the target gene. The most efficient method to deliver Cas9 and gRNA plasmids depends largely on the cell type. For easy-to-transfect cell lines, non-viral constructs are often suitable and can be delivered with high efficiency by lipofection. The plasmids usually contain selection markers to confirm effective delivery, such as antibiotic resistance gene s or fluorescent proteins. For hard-to-transfect cell lines, such as stem cells, viral-based transfection methods may be more effective. Lentiviral vectors may be more suitable for these cell types. All of GenScript's lentiviral vectors are compatible with 3rd and 4th generation lenti-packaging systems. Ran et al. Genome engineering using the CRISPR-Cas9 system. Nature Protocols. 2013; 8:2281.
gRNA design: GenScript's proprietary gRNA design algorithm uses the most current genome assembly data available from NCBI and other publicly available sources, and selects the best target sequences to avoid off-target effects. We search for an ~20 bp locus in the endogenous genome of interest for which a highly-similar match does not appear elsewhere in the genome. Off-target Cas9-mediated cleavage can occur even with up to 3 mis-matches between the gRNA and the endogenous genome, though most papers have reported little to no off-target effects. nuclease / targeting strategy: Most researches use the Cas9 nuclease isolated from Streptococcus pyogenes. Cas9 WT induces double-strand breaks that are typically repaired through non-homologous end joining (NHEJ), which introduces small insertions or deletions that lead to frame-shifts and total loss of protein expression. This has proven to be an easy and effective way to introduce phenotypic KO in every cell line and organism attempted to date. Another strategy employs a mutant version of this enzyme, Cas9-D10A (Nickase), which can be used to induce two single-strand breaks flanking a region you want to delete for a more specific or comprehensive knock-out. If you require gRNA sequences for use with a different enzyme, or have other special requests for your CRISPR targeting strategy, please email your request to us. number of unique gRNA sequences used: Based on our in-house experience using our design tool to create knock-out cell lines, a single gRNA construct is typically sufficient to knock-out your gene of interest; however, we recommend ordering at least two gRNA constructs per gene that you want to target in order to increase your chance of successful genome editing without off-target effects. When you order gRNA clones from GenScript, we deliver a sequence-verified plasmid containing all elements required for gRNA expression and genome binding: the U6 promoter, spacer (target) sequence, gRNA scaffold, and terminator. We guarantee sequence accuracy for gRNA clones we deliver; however, given the complexity of creating genomically edited cell lines including transfection and selection, we cannot guarantee the outcome of experiments performed using our gRNA constructs. If you prefer to receive sequence-validated KO or KI cell lines created using CRISPR technology, please refer to our GenCRISPR™ mammalian cell line service. To learn more, please check out our archived webinar: Can CRISPR/Cas9 off-target genomic editing be avoided? Ways to improve target specificity. 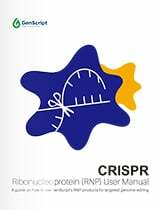 Choosing the vector(s) you'll use to express the two critical components needed for CRISPR/Cas9 genome editing, the guide RNA and the Cas9 nuclease, is an important step in your experimental design. Many researchers prefer to use an all-in-one vector that will drive expression of gRNA and Cas9 in a 1:1 ratio. All-in-one vectors may also contain selection markers, such as fluorescent proteins or genes conferring antibiotic resistance, which can make it easier to isolate desired genome-edited clones. You may prefer to express the gRNA and Cas9 from separate vectors, for example if you want to vary the gRNA:Cas9 ratio, or if you want to screen a pool of gRNAs or use a larger gRNA library. Want some more information? Check out our CRISPR gRNA construct service FAQ. The following procedure is based on HEK293 cells. To use host cell lines other than HEK293, please follow the instruction from original supplier for cell culture, passing the cells, transfection and subcloning. If you have specific questions about how to adapt this protocol for your needs, we recommend consulting the public online forum for Genome Engineering using CRISPR/Cas Systems. Culture the host cells (HEK293) in Eagle's Minimum Essential Medium supplied with fetal bovine serum to a final concentration of 10%. Incubate cultures at 37°C. Subculture when cell concentration is between 6 and 7 x 104 cells/cm2. Seed 4-6x104 cells/cm2 in cell culture plate one day before transfection. 2-3 days after transfection, the cell pool can be analyzed directly by Sanger sequencing, NGS (Next Generation Sequencing) and/or Surveyor assay. Here the commonly used methods of Sanger sequencing and Surveyor assay (or T7E1 assay) are briefly introduced. Sanger sequencing of the target region can detect overlapping peaks at close region of double strand break (DSB), if small insertion or deletion (indel) mutations are introduced. Surveyor assay (or T7E1 assay) uses enzymes of mismatch-specific DNA endonucleases to detect indel mutations at the targeted loci. By targeting and digesting mismatched heteroduplex double-strand DNA, this assay produces two or more smaller fragments, depending on number of mismatched sites on the region analyzed. These assays can be conducted following instructions from supplier. Transfected cells (with or without selection) can be plated into 96 well plate at 1 cell/well density for cloning. This procedure can be also conducted using diluted host cell line on 10 cm plate to form colonies, which can be picked up and transferred to 24 well plate for future usage. *Note, selection using antibiotic containing medium can induce random integration of the cas9 expression plasmid onto host genome. After expansion of the clones, the cells in each clone can be analyzed by Sanger sequencing to identify the clones harboring a mutation at the target region. Sequencing trace files will show overlapping peaks at regions where double strand breaks have been repaired by introducing small indels. Knock-out cell lines can be confirmed by Western Blot if a specific antibody is available, or through functional assays specific to the gene that was targeted. To accelerate your research, GenScript offers validated CRISPR products, services and resources to help you harness the power of CRISPR genome editing. Sequence verified ssDNA up to 3000 nt long for the BEST CRISPR knock-in efficiency and accuracy!